With large tropical rainforests, river systems, coral reefs and rugged mountains, Queensland is a nature lover's paradise. 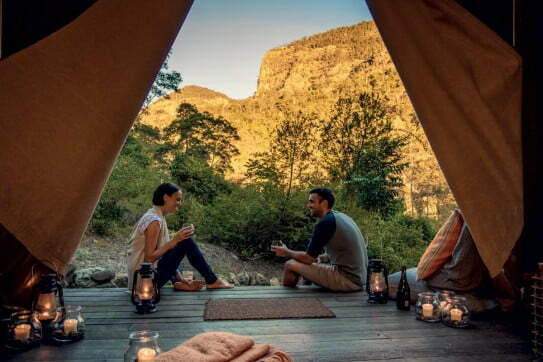 Get back to basics and head out on your own two feet, or let the locals help you to connect with the planet through luxurious glamping experiences. Wherever there's a forest or sanctuary, you can count on interesting animal and bird encounters. Queensland natural tourist attractions are truly spectacular. From ancient rainforests and enormous sand islands to coral gardens and mountains, there's a huge range of experiences to enjoy. Find Brisbane's best angle on a scenic walk up Mount Coot-tha. It's an easy drive from the city, and you can take your pick of forest trails. We suggest starting at Slaughter Falls. Despite what the name suggests, it's an enchanting walk peppered with Aboriginal artworks. Looking for a little magic? Head up at night to enjoy the enchanting star-lit sky and distant city lights. Swap cityscape for sandscape by heading to Moreton Island to hike up the highest coastal sand dune in the world. At 285 metres, it will definitely make you earn your lunch. You can even stay overnight on the island in a resort that looks back to the mainland across Moreton Bay. For more island adventures, read more on Queensland beaches, reefs and islands. Many Queensland mountains are ancient eroded volcanoes, thrusting skyward on the forest-covered hinterland. They reward hikers with spectacular long-range views and some of the best walks in Queensland. Priceless and unmissable, the Sunshine Coast's Noosa Everglades is one of only two everglade systems in the world. When it comes to natural wonders, Queensland national parks are a treasure trove. The Lamington National Park is a short drive from the sandy beaches of the Gold Coast and offers several ways to get closer to nature. Here you'll find a tree top walk Gold Coast visitors love. Suspended 30 metres above the ground, O'Reilly's Treetop Walkway lets you move through a glorious canopy of flowers and vines. The fascinating local birds seem unaffected by your presence as you wander through their treetop home. Living in the great outdoors is part of the Queensland lifestyle. 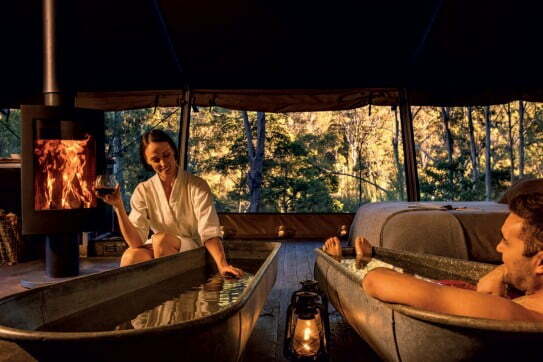 If you fancy some tranquil rainforest glamping, Queensland is the place to be. At Nightfall Wilderness Camp, architect-inspired safari tents allow you to spend a luxurious night in the park. Lavish meals are prepared on an open fire and massage tables sit on river rocks, with the tumble of the water only adding to the peace and tranquillity. In winter, a roaring brazier warms the interiors as light flickers against your tent. It's pure indulgence. Priceless and unmissable, Noosa Everglades on the Sunshine Coast is one of only two everglade systems in the world. A hub for eco-cruising, this unique environment will refresh and inspire. Cruise down the waterways, taking in the mystical River of Mirrors and its wildlife - inshore dolphins, sea turtles and mangrove butterflies. You might even see a dugong. To spot another of nature's elusive marvels, head to the Mackay region. When Europeans first saw the duck-billed egg-laying platypus, they thought its crazy appearance was a hoax. These mammals have a reputation for shyness, so it's something of an achievement to see them in the wild. A journey down the Daintree River, north of Cairns, is like getting a backstage pass at Brisbane Zoo or a reptile park. This is one of the most densely populated mangroves in the world, where a keen animal lover can spot birds, frogs and goannas. But don't let excitement get the better of you. It pays to stay in the boat. The area is also known for crocodiles. The outback is one of the less well-known Queensland points of interest, but if you're interested in prehistoric creatures, a journey inland is essential. Fossilised dinosaurs, some around 100 million years old, are scattered across the region. If you're keen, you can dig them up and play at being a palaeontologist. The Australian Dinosaur Trail is a 550km road trip that takes in marine dinosaur fossils in Hughenden and Australia's largest dinosaur in Winton. It also passes through small outback towns that showcase colonial architecture from the days of the gold rush. For natural encounters with a side of adrenalin, see adventure and discovery in Queensland.